Mermaid wedding dresses have always been considered very elegant and specially created to convey the appearance of a bride a unique and memorable look; that look that stays for ever imprinted in the timeless frames of dear memories. The following features are the ones to make the mermaid style of a wedding dress to be favored over the other four commonly known styles: Princess style, sheath/column style, ball gown and empire style. * The mermaid style is when the silhouette of the dress outlines the body from the chest line to the knee for after that to flare out to the hem. * Due to this cut, the mermaid wedding dress looks very sensual as it highlights the curves of the body of which the bride should be very confident when deciding to go for this style. * The mermaid style of wedding dresses can go for almost all the necklines as well as for the sleeves lengths, in this way being able to reveal or to cover as much as you as a bride are comfortable with. In case you need to show as much of your skin you can choose the strapless neckline or you can opt for a halter that is designed with a plunging v-neck to emphasize the seductive side in you. 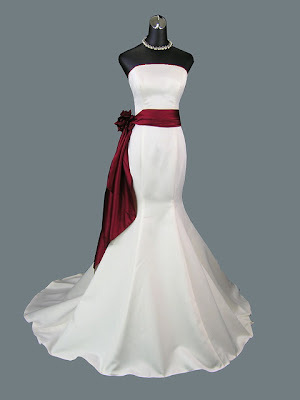 * The overall aspect of the mermaid wedding dress is most of the times influenced by the choice of the skirt style. Thus you can chose a wedding dress that the skirt flares out above the knee, or one that can flare out at the knee or below. This skirt positioning has an influence on both the overall aspect of the wedding gown and on the symmetry of the body’s proportions as a visual effect. This is a feature that bride needs to pay attention to as the shape of the body has a lot to say in this aspect. * The hem together with the skirt will bring various effects as a round skirt will bring volume to the lower part of the dress and a trumpet flare will create volume that flows out behind as the bride walks forward. The mermaid wedding dress can come as well with the flamenco flare of the skirt that brings the dress a Spanish touch and the bride to wear it a special elegance mixed with the feeling of flexible moves. Along with all these features, brides need to understand very well the way their body is built as the mermaid wedding dress style is not for everyone. This style is more suitable for slender figures both tall and short. Due to the fact that mermaid wedding dress is the one to contour the body it is not appropriate for the future brides who are plus size although till a certain extent they can be altered to look sensual on them as well.